European prints and drawings 1500-1900 presents over 170 prints and drawings made in Europe between 1500 and 1900 from the collection of the Art Gallery of NSW. The Gallery’s holdings of European graphic art date from the 1870s, but it was not until the 1930s that a determined effort was made to build a broad historical collection covering all periods and schools. 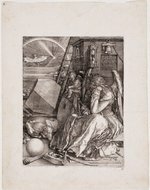 This ambition continues today, and a number of our recent acquisitions are displayed here for the first time, including Albrecht Dürer’s famous engraving of 1514, Melencolia I . Historically, the Gallery’s collection has been much stronger in its representation of prints than drawings, a fact reflected in this exhibition. Nevertheless, the selection includes some outstanding drawings by such names as Watteau, Fragonard, Gainsborough and Ingres, demonstrating the various functions that drawings served, as well as a diverse range of materials and techniques. Arranged chronologically, the exhibition mirrors the evolving artistic preoccupations from one age to the next. The great subjects of European art and the changing attitudes towards faith and philosophy, power and politics, the individual and society, are here all captured on paper. From the Renaissance onwards drawing came to be recognised as a distinctive activity fundamental to the painter’s practice. Drawing was not merely about observing and recording, it was also about inventing and working out. Drawings, especially preparatory studies, also came to be prized as direct expressions of an artist’s character, showing evidence of the creative mind at work in the construction of a composition. Prints, by contrast, were appreciated for other reasons. As finished compositions they are arguably closer to paintings than to drawings. Their most important characteristic is their multiplication but they remain in every way as original as any other visual art form. Many of the greatest artists (Mantegna, Rembrandt, Goya, Whistler) have been masters of the diverse art of printmaking, exploiting the unique capabilities of the process to produce aesthetic effects unrealisable in any other way. Their prints are not reproduced drawings but works of art deliberately created through the medium of printing. What is the role of art museums? Why does the Art Gallery of NSW have a European prints and drawing collection? Consider the history of our collection and discuss the significance of our European prints and drawings collection for the people of New South Wales. Consider the role of drawing for artists. Find examples in this exhibition where an artist has chosen drawing to prepare for a painting, drawn details of architecture or has created a drawing purely as an artwork. Discuss how these approaches are similar or different. List the printmaking techniques used in this exhibition. Create a visual diary of these techniques and note the variations in effect. What technique do you prefer and why? Inspired by this exhibition, choose a printmaking or drawing technique that you have not attempted before. Apply this approach to a landscape, portrait or a historical scene of your choice. What have you learnt from this process? Are you happy with the result? Consider these questions when you present your work to the class. The artists in this exhibition are important figures in art history. Research the contribution each made to the art practice of their time, and create a visual timeline with this information.